Photo: Do our children really speak more than one language? How proficient someone is in a language is usually defined as how well they are able to perform not only in terms of speaking, but also across the other three communicative skills. Each one of the four communicative skills has its own value to the speaker or learner of a certain language . Speaking the language well allows us (and our little ones) to efficiency express our ideas, feelings, and opinions to others who understand that language. It allows us to crack a joke on the spot, to connect with the culture of that language, and in general, to get things done in that language. Understanding that language well, that is, having good listening skills in the language allows us to understand T.V. shows and movies in the language, engage in real-time discussions with speakers of that language, understand what is going on when we hear oral exchanges in the language while traveling, and so much more. Together, listening and speaking a language well allows us to truly engage in conversations with others and consume audiovisual materials in the language. In addition to being able to understand a language when listening to it and being able to speak a language, having reading and writing skills in the language can also be a fantastic tool, opening up golden opportunities not available to those with only speaking and listening skills in the language. Without reading command of the language, our children will not be able to read books, magazines, classroom notes, family holiday cards, game instructions, and many other materials in the language. If they ever want to study in a country where the language is employed in educational settings, they will not be able to follow courses, for example, since instructional materials will often be in that specific language. Without writing skills in the language, they will not be able to send an email to monolingual speakers of the language, submit classroom assignments in that language, or write secret messages in that language to other speakers… As we can see, each of the four communicative skills adds value to the picture of what it means to be a full bilingual, trilingual, or multilingual person. Unfortunately, as many of us parents who have gone through the process of teaching or trying to pass down our language(s) to our children will have to admit, most often than not our kids end up having only listening skills in the language. They are used to listening to the language at home and can understand things said to them in the language. However, they may answer back only in their strongest language (usually, the language spoken in the country where they are being raised). When our kids start going to school, it is even harder to motivate them to speak to their parents in their home language, due to peer pressure to be like the other (monolingual) children coupled with an unwillingness to be perceived as “different” (even if different in this case means “gifted”!). Photo: The Half-Baked Bilingual child, who only has listening knowledge of the language. Instead of simply feeling sorry that we are not raising fully-baked bilingual, trilingual, or multilingual children (i.e., children who are able to engage in the language across all four communicative domains), we should first ask ourselves: “Could I make things better by better choosing the materials I expose my child to in the foreign/heritage language”? The answer is: definitely. In order for children to want to speak, read, and write in a language, it is important that they have fun doing those things. 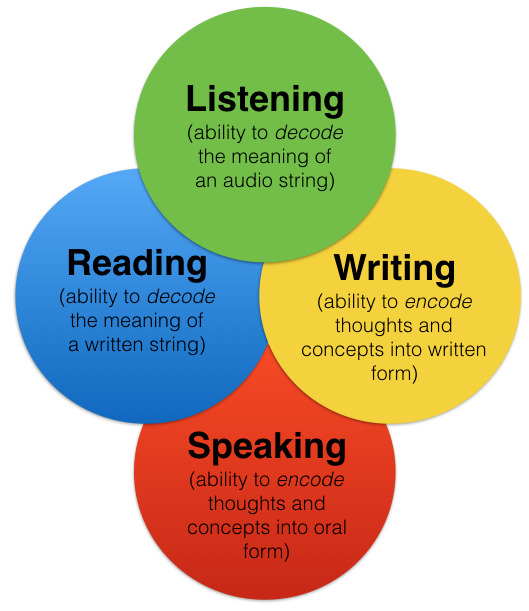 If the materials used to introduce kids to these skills in the language are not enjoyable or does not allow for separate practice of each of the four communicative skills, it is unlikely that the kids will find any use or purpose in going beyond simply understanding the language when it is spoken (listening ability). Photo: Example of a typical, poorly designed vocabulary flashcard. Many of you may be asking: “What exactly is wrong with this flashcard? It seems great to me!”. Good question. Let us analyze the flashcard above more deeply. When a child who in this case is learning Spanish looks at this flashcard, the opportunity to independently practice speaking, reading, writing and listening to that word has been completely taken away from them. Let’s focus on the various (non-apparent) issues with this type of design for a vocabulary flashcard, which is unfortunately so common in the market today. Issue #1: No chance to practice speaking on its own. By showing the image (concept) of the dog along with the word for dog in Spanish (perro) on the same side of the card, the child is prevented from simply looking at the image and trying to activate their Spanish knowledge by having to remember the word “perro” on their own. Being able to recall a word in the foreign language on the spot is a vital language skill. Issue #2: No chance to practice listening on its own. The type of flashcard above does not offer any listening practice, in which the child would listen to the word “perro” in Spanish and try to identify (decode) its meaning without a visual or written clue. Otherwise, how could the child be expected to talk to others over the phone or understand instructions directed to them from a distance? Issue #3: No chance to practice writing on its own. The purpose of writing in a language is to encode ideas and concepts into written form. Instead of showing the image of the dog separately from its written form, so that the child can try to remember how to write/spell in Spanish the word for dog, both the image of the dog and its written form in Spanish are presented together here, completely taking away a beautiful chance for the child to practice writing in Spanish. Issue #4: No chance to practice reading on its own. 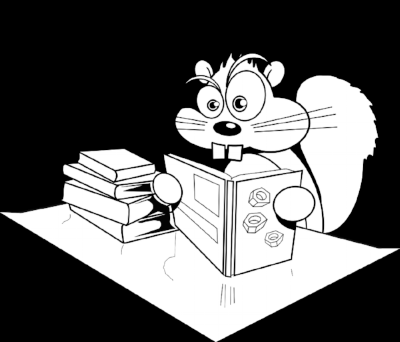 The purpose of reading in a language is to decode the meaning of a written text, whether the text consists of one word or a thousand words. Instead of showing the image of the dog separately from its written form, so that the child can try to remember the meaning of the word “perro” in Spanish , both the image of the dog and its written form in Spanish are presented together here, completely taking away a beautiful chance for the child to practice reading in Spanish. Photo: Inability to decode written strings/text in a language. Issue #5: Another significant issue with the type of flashcard above is that instead of offering language learners the actual pronunciation of the word in the foreign/heritage language, a supposedly phonetic version of the word “perro” is used instead, based on how speakers of English should try to pronounce that word. As any among us who have the most basic knowledge of Spanish will know, PEH-ROW is not how the word “perro” should be pronounced in Spanish (click here to hear the correct pronunciation). Using a supposedly phonetic alphabet (which, by the way, the one above is far from being) to teach kids how to pronounce words in a foreign language can lead to more damage than good, since there is a high chance children will learn inaccurate pronunciation of each word they are studying. The longer a child goes on pronouncing a word incorrectly, the harder it will be to correct that pronunciation later on (reference?). Moreover, the great majority of languages in the world have certain sounds that cannot be faithfully reproduced through this type of supposedly phonetic alphabet. The best approach is to simply expose them to a native speaker of the language pronouncing each individual word, allowing the child to use his or her amazing and well-validated language learning prowess to correctly fine-tune their pronunciation of the word. Photo: Let’s give our kids the chance to learn correct pronunciation! So, is all lost? Since the language learning market for children is unfortunately saturated with similar examples of poorly designed flashcards that lead to half-baked bilingual, trilingual, or multilingual children, should we as parents simply give up our search for vocabulary flashcards that allow independent practice of all four skills and which have been developed according to well-researched language learning principles? No, there is hope. One language learning company out there seems to be getting it right. Their vocabulary flashcards have been carefully designed by PhD language learning experts and their innovative design allows for the independent practice of all four communicative skills. Enter the Linguacious™ game-based vocabulary flashcards. Finally, a vocabulary flashcard game that allows for practice of all four communicative skills from a young age! The Linguacious™ Around the Home Spanish game-based vocabulary flashcards. The award-winning Linguacious™ game-based vocabulary flashcards were developed by a team of PhD language learning experts with extensive experience in the development of language learning materials that closely follow scientific principles of successful language learning. Available in various topics and languages such as Spanish, Russian, French, German, Hebrew, Chinese, Portuguese, and others, the flashcards have been tested on a large number of children aged 2-12, allowing Linguacious™ to fine-tune their product after each round of feedback from child and parent users. Photo: Example of a Linguacious™ flashcard in Spanish for the word “shoe” allowing learners to independently practice all four communicative skills. So, what makes the Linguacious™ game-based vocabulary flashcard design and features seen above so much better than the great majority of the vocabulary flashcards currently available? Let’s take a look at these design and features through their Spanish flashcards in the “Around the Home” topic. Photo: Optimal flashcard design for effective vocabulary learning that tackles all four communicative skills (courtesy of Linguacious™). Spanish version of “Around the Home”. 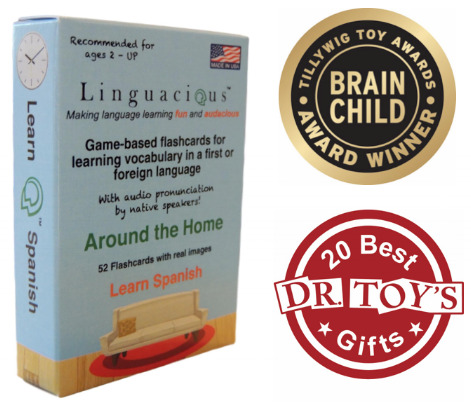 Feature #1: The Linguacious™ flashcards allow for independent practice of speaking. By looking at the image on the front of the first flashcard to the left on the image above, learners have to actively think how to say the word ‘shoe’ in Spanish. Once they have activated their brains and strengthened the synapses that allow for quick recall of the word “zapato” in Spanish, they can then simply check their answer by either looking at the written form of the Spanish word on the back of the card or by scanning the QR code on either side to listen to a native speaker of Spanish pronouncing the word “el zapato” . Feature #2: The Linguacious™ flashcards allow for independent practice of listening. By asking another person to play the audio of the native speaker pronouncing a certain word by having them scan the QR code on either side of the card or by playing the words from the Linguacious™ website itself, learners can practice decoding the meaning of the audio string in Spanish. When they hear the expression “el zapato” pronounced by the native speaker, they have to activate their mental dictionary in Spanish and think of which concept that expression relates to (the concept of a shoe). 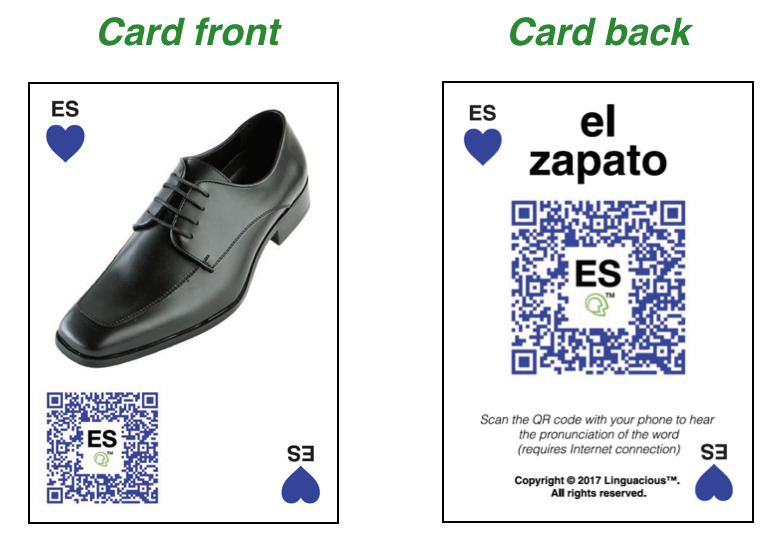 Alternatively, given the standardized design of the Linguacious™ flashcards, learners themselves can simply cover the written version of “el zapato” on the back of the card and scan the QR code to listen to the word, without any extra clues to its meaning. Feature #3: The Linguacious™ flashcards allow for independent practice of writing. By looking at the image on the front of the card or by scanning the QR code on the front of the card to listen to the word being pronounced, learners can independently activate their ability to write/spell that specific word in Spanish. To check their answer, all they have to do is flip the card over and check the written form of the word on the back. Feature #4: The Linguacious™ flashcards allow for independent practice of reading. As we have seen, the purpose of reading is to decode the meaning of a written string. By simply reading the expression “el zapato” on the back of the card, learners using the Linguacious™ flashcards are not given any clue as to what the meaning of the word is, and have therefore to active their knowledge of the foreign/heritage language in order to come up with the meaning of the expression “el zapato”. Feature #5: Instead of relying on a poor phonetic version of the foreign word, the Linguacious™ system employs real audio pronunciation of each word by a native speaker of the language, significantly increasing the chances that children (and adults, for that matter) who use the cards will end up acquiring good, accurate pronunciation of the word. Feature #6: Finally, another major asset of these flashcards is the fact that learners can play over ten different games to learn and strengthen their knowledge of each word across all four communicative skills. Each of the games caters to children of different ages and different levels of cognitive and linguistic development, making sure that everyone (even adults!) can play at least some of the fun Linguacious™ games in an effort to invest in their fully-baked bilingual, trilingual, or multilingual themselves. Photo: Examples of the games that learners can play with the Linguacious™ vocabulary cards (full instructions can be found on their website). Feature #7: The Linguacious™ vocabulary games can be played across cards of different topics and/languages. Therefore, the more topics and languages the games are played in simultaneously, the higher the challenge, but also higher the engagement and nurturing of multilingual capabilities in our children. The Linguacious™ flashcards are a great example of a language learning company that puts learning at the forefront of their products. By designing their flashcards in a way that allows children (and adults) to practice each of the four communicative skills independently when playing with and studying their cards, Linguacious™ brings our intention and dreams of raising fully-baked bilinguals closer to a reality. Naturally, the work does not stop with vocabulary learning through flashcards, since successfully learning a language requires knowledge of other areas such as grammar, culture, and pragmatics, as well as materials that can help learners advance to much higher levels of proficiency in the language as they advance. Still, by starting our little bilingual, trilingual, and multilingual ones from a young age on a path of success by using materials such as those by Linguacious™, we are increasing their chances of fully savoring and consume every bit of a language when reading, speaking, listening, or writing in it. What is YOUR experience raising a bilingual, trilingual, or multilingual child? Let us know about your experience by leaving a comment in the comment box below! There is an actual phonetic alphabet called the International Phonetic Alphabet (IPA), which allows users to faithfully represent the sounds of any human language. Use of the IPA for pedagogical purposes is, however, a contentious issue. Spanish makes use of grammatical genders. Every noun is either masculine or feminine, and “el zapato” indicates that “zapato” is a masculine noun, preceded by the masculine definite article “el”.